When Moët & Chandon announced that it would be releasing its flagship cuvée, Dom Perignon, from the 2003 vintage it was a bold move. 2003 in Champagne was one of the most unusual years in recent times, partly because of severe frosts that damaged the crop in the Spring, but mostly because of the unprecedented heat-wave and drought that lingered in this normally cool, damp region through the mid-summer months leading to the earliest harvest on record. Writing for wine-pages in 2007, Tom Stevenson analysed the 2003 vintage in relation to a special release by the house of Bollinger: ‘so not Bollinger’. Vintage Champagne is normally released only in exceptionally good years, and for many houses, 2003 was just too weird to be classed as that. They did not release a vintage, let alone a prestige cuvée. Cellarmaster Richard Geoffrey (left) suspects that so few vintage wines were made not because the conditions made it impossible, but simply because picking in 2003 had to start very early indeed, in mid August, a time when France normally closes down for holidays. To preserve acidity it was essential to get picking teams into the fields early – harvest started on the 20th of August for Dom Perignon – but many houses could not get organised in time. Geoffrey talks about the paradox, the chiarascuro of 2003 in terms of the climate. And yet he believes his 2003 in bottle is not so unusual and is true to the spirit of Dom Perignon within the character of the vintage, as it always is. He also says he was determined to release the wine despite going out on a limb to do so, to show what Dom Perignon could do even in a year like this. Frost decimated the crop in the spring, especially the Chardonnay, resulting in yields of just 25hl/ha, which is extraordinarly low for the high-yielding vineyards of Champagne. The summer brought huge temperatures and drought. Knowing this, it is all too easy when tasting the wine to look so closely for tell tale signs of the peculiarities of the vintage that perceptions are distorted. The 2003 Dom Perignon already shows more notes of toast and butter than would be usual, but Geoffrey says this was a particular character of the Chardonnay as soon as it was picked (Dom Perignon is never fermented or aged in oak). Interestingly, he has also said that the dosage of this wine is only around 6g/l, as opposed to the 11g/l that might be more typical – perhaps lowering the sweetness to help accentuate the acidity. Moët & Chandon unveiled its new baby over a specially prepared lunch at the Gleneagles hotel in Perthshire, Scotland. With the 2003 being served throughout the meal we dined on seared, hand-dived Scottish King scallops with gingerbread, garden leeks and orange, then free-range hen’s egg with Finnan haddock, butternut squash, broad beans and saffron. The main course was St Bride’s duckling breast with foie gras, chilli and roasted peach, and we continued to sip the Dom Perignon 2003 with Perthshire raspberries, chocolate marquise, marscapone cream and heather honey ice cream. In terms of the food match, well the wine did indeed show huge versatility, the typical DP freshness lovely with the scallops, the extra buttery character and weight of the vintage set nicely against the rich, creamy hen’s egg and the wine having the gravitas and substance to match with the duckling breast. Against the tartness of the raspberries the fruit and that fresh, mineral clarity also worked really well. 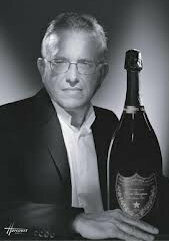 Dom Perignon 2003 currently sells for around £95 per bottle including duty and VAT if buying by the half dozen. And it is a very fine Champagne that’s not nearly so atypical as you might expect. It should age quite gracefully for many years too. Beautifully buttery and toasty, with a tight, floral and mineral edge that has a lime-peel freshness. Tightly defined. On the palate the mousse is racy and fresh – that impression of tightness and youthfulness continues. There’s a hugely decisive core of lemon and red apple acidity. There’s a hint of Ogen melon too and the gentle smokiness and buttery toast is there, but this is wonderfully tight and fine. Acidity is relatively low, giving this a breadth in the finish, but that doesn’t blunt its assertive, defined clarity and precision. 94-95/100. See all stockists on wine-searcher.